This is just a sample of some of the events and exhibitions that have been held in Hatfield over the years. From heavy plant equipment to military parades or space exploration – there's something for everyone. Europe's largest craft fair – Living Crafts – is held in the grounds of Hatfield House every year (usually in May). Europe's largest plant demo – SED76 (Site Equipment Demonstration) was held in Hatfield in 1976. Hertfordshire County Show – Hertfordshire Agricultural Society was first formed in 1801. The society was in decline when, at a meeting in Hatfield in 1879, the idea of a exhibition was proposed that helped revived the society. 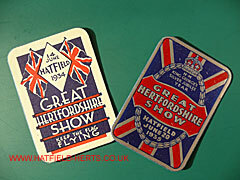 The revived society held its first show in Hatfield in 1880. The society later bought the land, where the show is held to this day, in 1962. The image above shows beer labels for the 1934 and 1935 shows. Hatfield House Country Show – annual country fair held at the exhibition grounds at Hatfield House. Bentley Drivers Club summer rally and concours d'elegance – were held in the grounds of Hatfield House in 2003 and 2004. Hertfordshire Regiment annual camp – in 1924 the regiment held its annual camp in Hatfield Park. Hertfordshire Boy Scouts' County Rally – some 4,000 Rover scouts, Scouts and Cubs attended this event held in Hatfield Park in 1933. Also present was the Chief Scout and the Chief of the Girl Guides – Lord and Lady Baden-Powell. Royal Review of the Hertfordshire Militia Regiments – carried out by King George III at Hatfield Park in 1800. Lewis Carroll and Hatfield House exhibition – in his diaries, Charles Lutwidge Dodgson (better known by his pen name Lewis Carroll) records no less than seven visits to Hatfield House. An exhibition in his honour was held in the Old Riding School from 25 March - 7 October 1975. European Week of Astronomy and Space Science Conference – held by the University of Hertfordshire in April 2009 at its de Havilland Campus. Opened by Science Minister Lord Drayson.